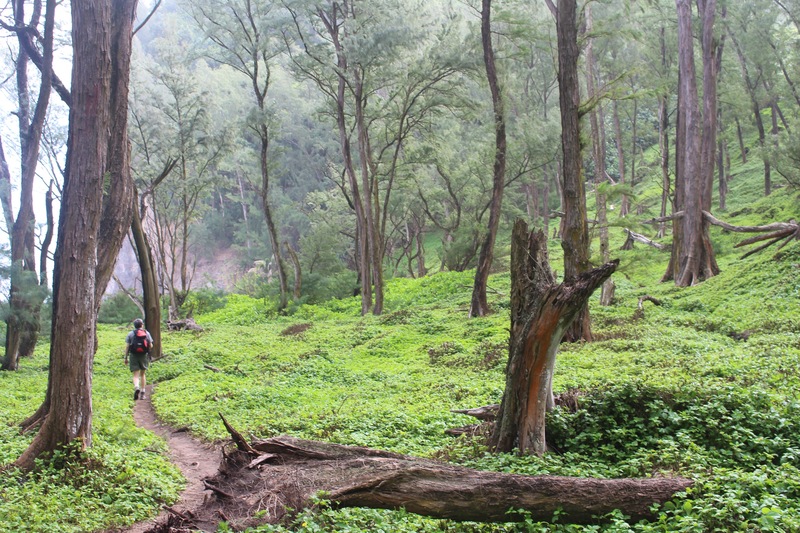 When our friend Kim Arline, an avid outdoorswoman and athlete, heard we were visiting the big island, she was very excited to share some recommendations with us. 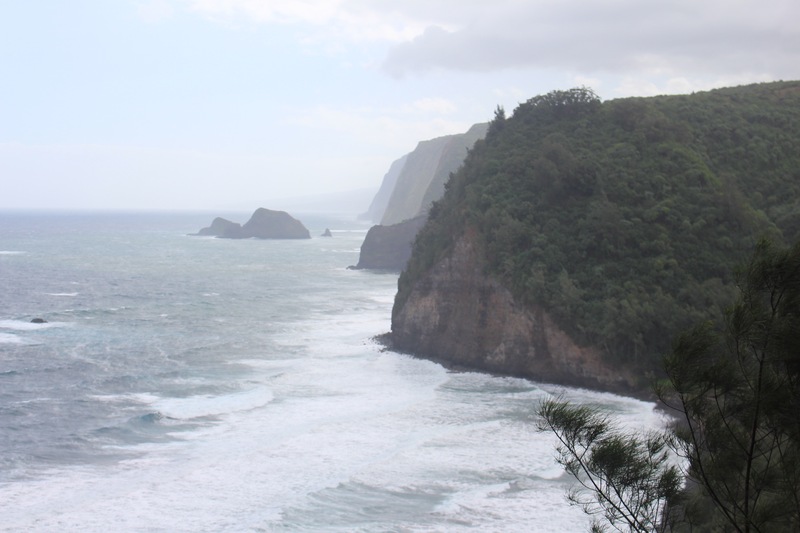 One of the places that she was most excited for us to see, and to hike, was the Pololu Valley Overlook. While I’m sure Kim wanted us to hike in the area, it was obvious from her enthusiasm that she most of all wanted us to SEE this spot just past the northern tip of the island. We took this hike on Monday, our last full day on the Kona side of the island. The hike begins where the road, Highway 270, ends. There’s a small parking lot that fills up quite quickly. We took the first spot we found on the road, and as we walked toward the parking lot, we concluded that it was a better call than trying to get into the lot, since maneuvering the minivan would have been tough. 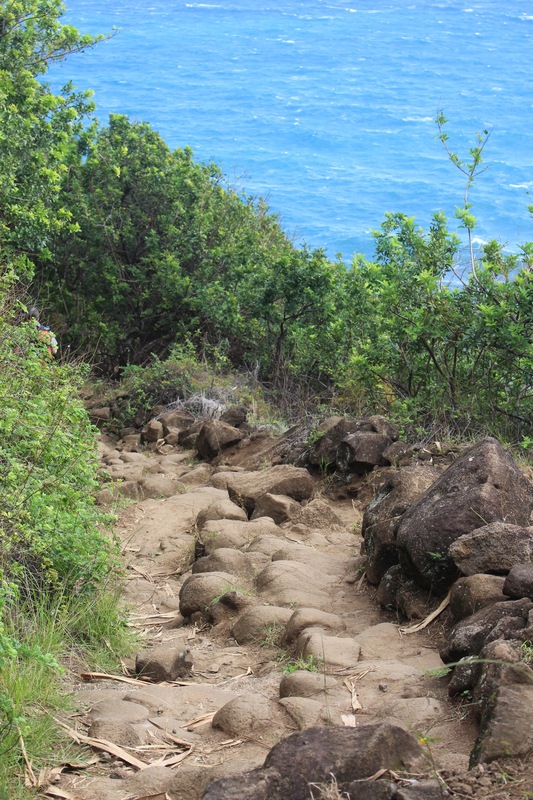 The hike start with a descent down to the black sand (rock?) beach. The beach is not extensive, but it’s backed up by a area covered with trees and some areas that have been man made to serve as picnic or camping areas, though camping is actually not legal in the area. It’s only about 450 feet down to the beach over about four tenths of a mile distance. It seemed very steep and I was worried about the return, but, especially since I had a hiking pole, it was not too bad on the way back up later on. is a path that goes through some low ferns and works its way up the hillside. We didn’t go as far as we wanted to on this trail because it was moving more into rain forest, which meant bugs. Side note, mosquitoes were not known in Hawaii until the early years of the 19th century. Of course, many native flora and fauna have been pushed out by introduced species. For example, the mongoose, of which we saw many on our kayak/snorkeling day, were introduced to get rid of rats (previously introduced of course) but ended up being much more interested in going after native birds. But I digress. I turned round on that part of the trail quite soon, to avoid the bugs. Angie went on a bit further, but didn’t go all the way to the end, since it got steeper and more slippery. When she came back to where I was waiting, we returned to an area near to the beach that had been set up as a sort of seating area, with a big plank that had been turned into a bench, along with another object that had been put down as a seat, though we couldn’t figure out what it had been previously. We sat here to eat our lunch. 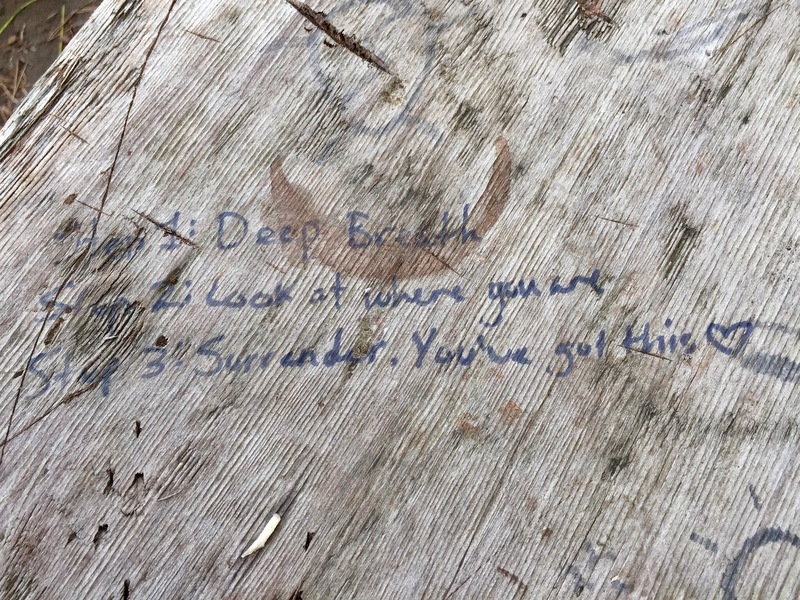 After I’d eaten my brie and pretzel roll sandwich, I looked down and saw that someone had written an inscription on the plank. Here it is. After we’d eaten, we trekked back up to the overlook. It was even more crowded than when we’d arrived. Although this was not a long hike, or as strenuous as we expected, it was definitely super rewarding. We rewarded ourselves even further on the way back with some rather decadent treats, despite the lack of a major workout. The first reward, in Hawi, was a scoop of Tropical Dreams ice cream at the Kohala Coffee Mill. The coffee cookie ice cream was very good, and Angie also tried the coconut, which she said was really good. 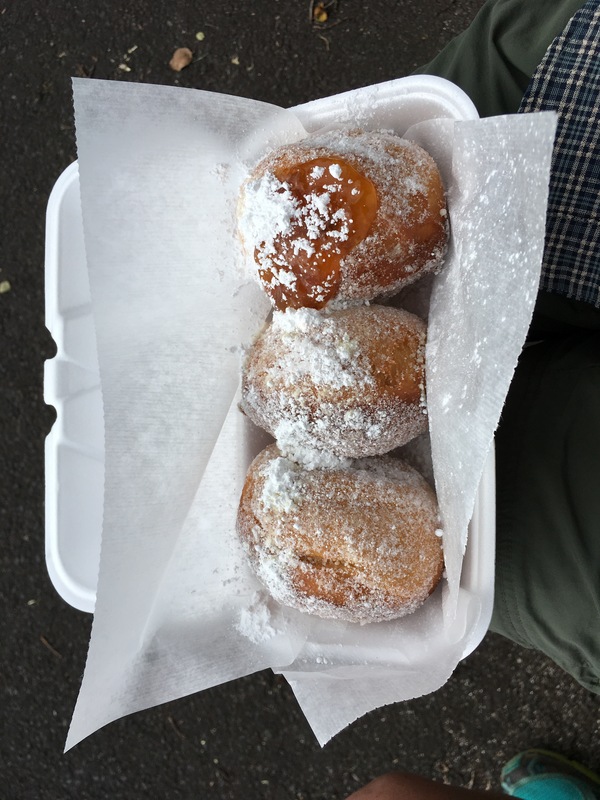 The second reward, in Waimea, was malasada. 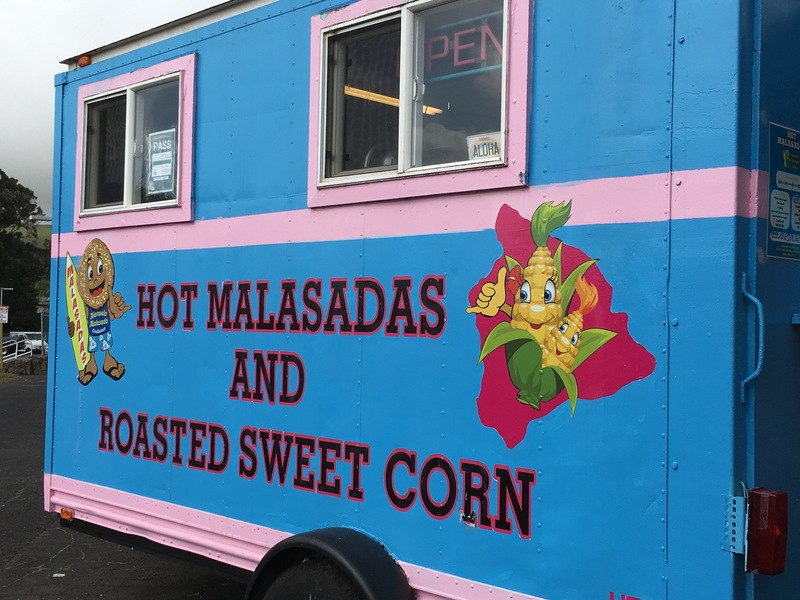 My friend Amy had recommended a brew pub in Waimea, but since I can’t drink beer and Angie wasn’t in the mood, we decided to stop instead at Manuela Malasada, a donut truck nearby. We had two with sugar, and one filled, with mango. They were delicious, but Angie still prefers the beignets we had in Paris, and I still have a soft spot for the loukmades we had in Kalamata when we said goodbye to my sister in Greece. It was an excellent day all round. 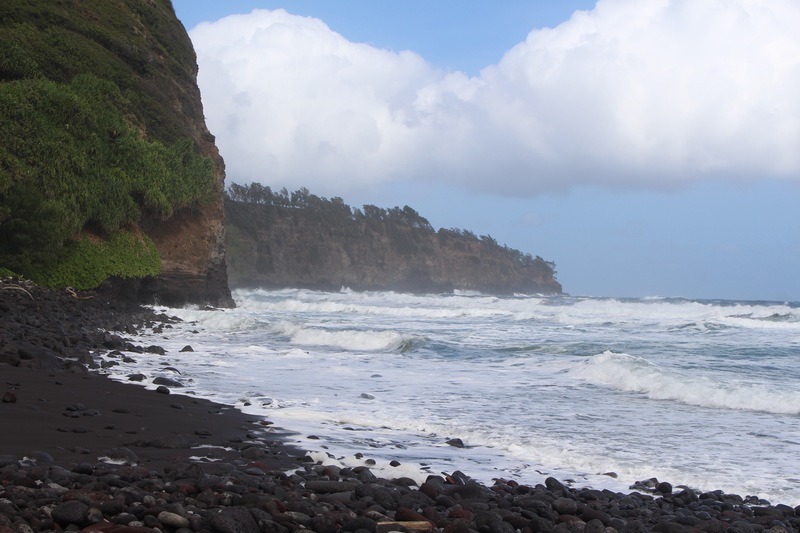 Geological notes: Pololu means spear. The area is so named because of the large deep cuts in the land due to behavior of the oldest volcano on the big island, Kohala. This area is the oldest part of the island also. My two favorite flavers of ice cream.